The du jour discussion of a 30mm Cannon equipped Stryker is of limited relevance to the Australian Army. The debate concerns at least three issues: AFV design, deterrence and assurance and force design. 1. Assuming that technology, terrain, training and beyond line of sight fires are vaguely equal; an AFV built strictly to destroy people and things will always defeat an AFV designed to conduct reconnaissance, transport things, self deploy between theatres of operation or repair things. 2. Given 1, the latter should avoid the former. Although, see 3. 3. AFV lethality is a complex algorithm. Weapons (cannons and missiles) + sensors + crew + turret speed + fire control system + mobility + into action time + reload time + crew + ergonomics + ammunition type. 4. 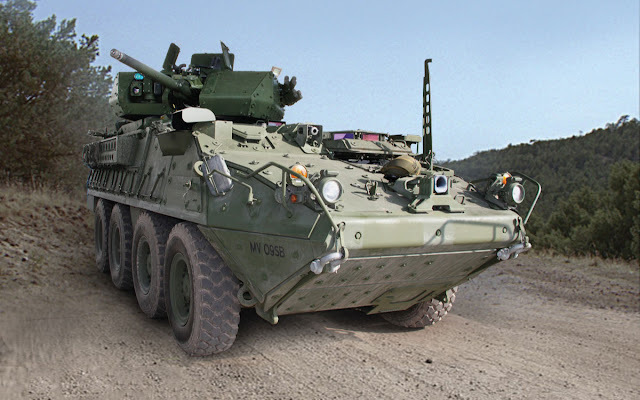 Given 3, correlation of a "Stryker with a 30mm" with all wheeled AFV is simplistic. 5. War is a duel. An AFV with a balanced firepower/protection/mobility package and growth potential makes an enemy work harder for advantage. More of all of them with undue compromise of the others is always better. 6. To what degree the 2 CR presence in Eastern Europe deters aggressors and reassures allies cannot be calculated. 21st century deterrence is a complex equation of domestic and regional politics, adversary threshold for military action and military capability. Force ratios are one component of this equation. 7. Given 6, operational mobility, ease of sustainment and endurance may be more important variables than lethality. 8. The Australian Army's Armour forces must be designed to adapt. Open minded humans and high quality vehicles with a balance of firepower, protection, mobility and growth potential will be the basis of this capacity. 9. The 30mm Stryker in Eastern Europe case study is a single data point and should not influence a 30 year capability. So What? Details and context matter simultaneously. Comparisons between a Stryker with a 30mm for 2CR and future Australian tracked and wheeled AFV is a pears and mandarins, chicken and egg discussion. The armoured forces of the United Kingdom cluster around the Salisbury plain where the terrain is polite and observation is unfettered. This terrain is not a perfect facsimile of Western Europe but it is not markedly different either. Salisbury plain is only 150 kilometres from France. Berlin, in the far east of Germany, is only 850 kilometres from the English channel. By comparison, in 1941 - 43, the Wehrmacht fought twice that that distance Eastward to barely make the border of what is now Russia. But even this vast campaign could be comfortably accommodated south of Brisbane. In contrast to the Australian Army’s potential operating environment, Western Europe is a small area of open terrain well served by potential lines of communication. These characteristics shape the way the NATO land forces think about warfare. In the late 1970’s General Dupuy designed the US Army and procured the “big five “- Abrams, Apache, Blackhawk, Paladin and Bradley to fight in Western European defensive operations. The operational concepts of his time and later General Starry’s, Elastic Defense and Air Land Battle, have been aped in all Western armies to some degree. Further, the limitations and advantages of the principal equipment and copies of them, can result in inadvertent alignment with the US model. This statement doesn’t devalue the alliances between Australia and other nations; it suggests that we should think carefully about the design of the Army relative to its primary operating environment. Air attack is likely to be very effective because of short transit times and open terrain that increase the destructive value of any mission. Successful long range direct fire engagements are common. Because Western Europe is small and defensive operations often use interior lines, logistic challenges are typically less than those of expeditionary operations in large, undeveloped theatres of operation. Much of the terrain is trafficable by tracked vehicles. Accepting these assumptions may have undesirable consequences for a small Army on an Island in the Pacific. Unfortunately, normal human interest in the massively powerful, heroic or spectacular collude to leave Australian Armour officers particularly vulnerable to Western European infatuations. The elements of this infatuation are a view that Armoured Fighting Vehicle versus Armoured Fighting Vehicle combat is the acme of the profession, a fascination with massing armour to the exclusion of other tactical approaches and a reduced appreciation of the value of dismounted operations. The Royal Australia Armoured Corps should institute a study of armour operations outside Western Europe and Iraq to avoid this bias. Three obvious contenders for further study are; North Vietnamese Armour operations in 1972, South African Armour in the Border Wars in the late 1980’s and Australian Armour in Papua New Guinea in the Second World War. Armour played an important role in North Vietnamese operations at An Loc in the Central Highlands in 1972. This operation was preceded by a prolonged and difficult deployment. The 38 T54 of 20th Armour Battalion travelled 1200 kilometres along the Ho Chi Minh trail in two months, suffered 30 air attacks without losing a vehicle, and carried 800 kilograms of fuel and parts per vehicle. 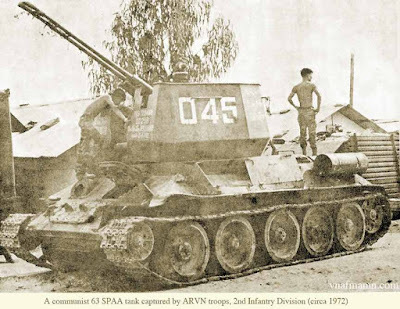 The appearance of the tanks created tactical surprise and gave the North Vietnamese Army the initiative in the days prior to the siege of An Loc. The final North Vietnamese operation to capture An Loc was carefully constructed to offset the advantages of the Army of the Republic of Vietnam (ARVN) forces. Mobile air defence systems ringed the city to protect North Vietnamese armour from helicopters and low flying fixed wing aircraft. On route 13, a motley North Vietnamese force of dug in infantry, obsolete captured AMX13 and M24 tanks, obstacles and mines interdicted South Vietnamese reinforcements. Despite the intelligent plan, An Loc did not fall. North Vietnamese units were defeated by a novel, or more likely desperate, combination of AVRN infantry and US Air Force strategic bombers. ARVN dismounted anti tank teams and obstacles took a toll on North Vietnamese armour units poorly synchronised with infantry and engineers in close terrain. North Vietnamese air defence systems, lethal to low flying aircraft, were powerless to stop high altitude B52 formations delivering hasty but overwhelming close air support. 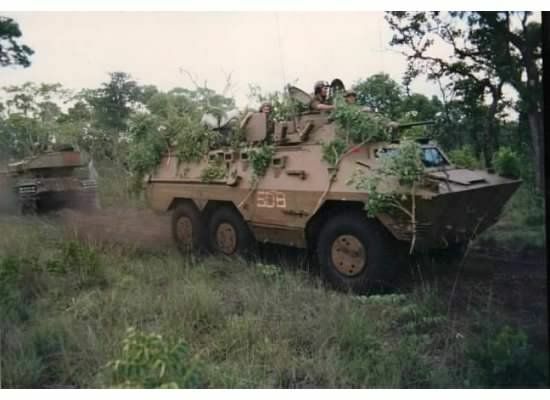 South African Defence Force (SADF) operations in Angola. The South African Border wars began as a insurgency and civil war in Angola. In the early 1980's financial aid and military advisor support from the Soviet Union enhanced regular People's Armed Forces for Liberation of Angola (FAPLA) units. In 1986 these units, backed by Cuban expertise, weapons and soldiers, embarked on a major offensive to defeat the National Union for the Total Independence of Angola (UNITA) who were supported by South Africa. In response the SADF executed Operations Modular, Hooper and Packer to first halt, and then destroy FALPA forces. To make contact with the FALPA an SADF Brigade deployed approximately 300 km from bases within South Africa. This long preliminary approach march reduced the capacity of the South African Air Force (SAAF) to remain on station and conduct close air support. As a result, the SADF Brigade relied heavily on tube and rocket artillery for close and deep fires. Whilst the SADF Brigade was equipped with Ratel Wheeled APC and a Squadron of tanks, sandy soil and low brush infestations restricted movement and increased vehicle failure rates. The brush also limited observation and most armoured vehicle engagements occurred at less than 200 metres. Standoff reconnaissance by air and radar yielded little actionable intelligence. South Africa units overcame these challenges through mission command and combat reconnaissance operations. To capture Buna in Northern Papua New Guinea Australian and US Forces attacked on two fronts, Warren and Urbana. Despite a desire to execute combined arms operations, the first attempt to move tanks forward to the Warren front on 13 Nov 42 sunk both landing craft and tank. Instead of tanks, Bren gun carriers accompanied the initial infantry assaults. Determined Japanese defenders, unaffected by preliminary bombing and artillery fire, blunted these attacks and inflicted catastrophic casualties. All five Bren gun carriers were destroyed. 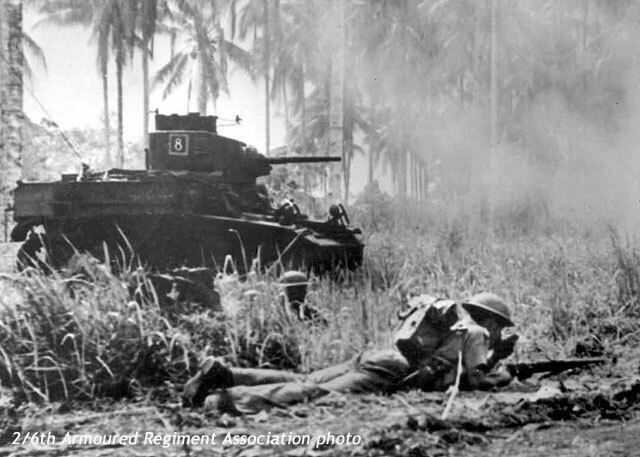 In early December 1942 the Australian 18th Brigade and eight Stuart tanks reinforced the Warren front. Tanks engaged bunkers at barrel length as crew commanders threw grenades from turrets. In turn, the tanks were destroyed by fires lit under them in the long grass, molotov cocktails and well concealed anti tank guns. As a result, historians remain divided as to the importance of the tanks to the ultimate success of the operation. This does not mean that Buna doesn't offer lessons to be learnt regarding tank/infantry/artillery cooperation and intra-theatre movement and sustainment. Buna isn’t an outlier. In the future the Australian Army will fight in the jungle, the enemy will dig in, and air power will be ineffective. An Loc, Angola and Buna are just three engagements of thousands that weren’t fought in Western Europe. Further study will illuminate tactics and capabilities that combined arms teams need to prevail in the Australian Army’s primary operating environment; focus unit professional development; and provide ready made vignettes for war games. Such study is the start point for the Royal Australian Armoured Corps to develop subject matter experts at fighting in terrain that is not ideal for armour but demands combined arms operations. Prior to the Napoleonic wars (1803 -1815), small land forces fought wars in pursuit of modest political goals. Battlefields were but a few kilometers wide, armies rarely exceeded 150,000 men, and the immediate presence of the sovereign shackled those armies to the achievement of political objectives. Societal changes during Napoleon’s time and the industrialization of Western Europe increased the scale and scope of conflict. By 1871, the Prussian Army alone consisted of 1.2 million men, ranging across a battlefield hundreds of kilometers wide and removed from the sovereign by distance and the limitations of 19th century communication. Single battles were no longer decisive in conflicts of this size. Defeating large armies demanded the execution of multiple battles linked to a common strategic purpose. Western Armies coined the term “operations” to describe these groups of tactical actions synchronized in time and space, and directed for a common purpose. Armies that conduct operations must be able to sustain tactical units at distance from their bases of operations. Tempo, or the frequency with which battles can be fought, is positively influenced by either fresh troops or reconstitution of troops that have already fought battles. During operations land forces gain positions of advantage by moving from from national bases to theatres of operations, between theatres of operations, or within theatres of operations. Tactical vehicles are not designed to conduct this movement and therefore the logistic implications of movement are an order of magnitude greater than maneuver. In summary, distance, a desire for tempo and the design of tactical vehicles collude to increase the influence of logistic factors on operations. The deployment of Task Force Eagle to the Bosnian theatre of operations in 1995 illustrates these factors. Representatives of Kosovo, Serbia, and Bosnia - Herzegovina signed the Bosnian peace agreement in Paris on 14 December 1995. NATO deployed the Multinational Implementation Force (IFOR) to implement the military components of the agreement. The US component of IFOR, Task Force Eagle (TFE), was to secure the Multi National Division Area of Responsibility - North (MND-N) and enforce the cessation of hostilities and handover of heavy weapons. 1st Armoured Division provided most of the 20,000 troops in TFE. V Corps established an intermediate support base and national headquarters in Hungary to deploy and sustain TFE. Ramstein air base in Germany was designated as the theatre APOD and APOE to receive supplies and personnel reinforcements from the continental USA. V Corps chose Hungary as the ISB location because it afforded access to a C-17 capable airfield and the European rail network. The movement of TFE to the ISB was a complex multimode undertaking. V Corps established logistics C2 at any point where stores and soldiers were loaded, cross loaded or halted. Rail access for the ISB was critical because TFE units deployed from from 30 desparate garrison locations in Germany to the ISB. Trains could not transit Austria, a non NATO nation, and this meant they travelled to the ISB via the Czech Republic and Slovakia. Using this route restricted train length, weight, and cargo tie down methods. Figure 1 gives an indication of the number of transport platforms employed for movement of TFE to the ISB and from the ISB forward to Bosnia. The V Corps force at the ISB consisted of around 4000 soldiers. These soldiers provided reception and staging facilities for up to 6000 transiting soldiers and 350 heavy vehicles at any one time. The ISB may seem large to deploy TFE; little more than a small Division. However, it operated four railheads, an APOD, a staging area and a freight forwarding area. The ISB also secured itself, conducted garrison policing, maintained host nation support, established and maintained contracts, fed and housed 10000 soldiers, maintained and replenished air and ground equipment, stored ammunition and other combat supplies, provided level three health support, provided water and electricity for lodger units, ensured local route trafficability and finally executed national C2 from the forward line of own troops in MND-N to the APOE at Rammstein, a distance of over 1000km. Logistic and combat support units from V Corps deployed TFE. TFE used prepositioned equipment and supplies, the requirement for which planners had anticipated many years earlier. The combination of prepositioned equipment and V Corps support meant that TFE was ready to fight on arrival in the MND-N area of operations. 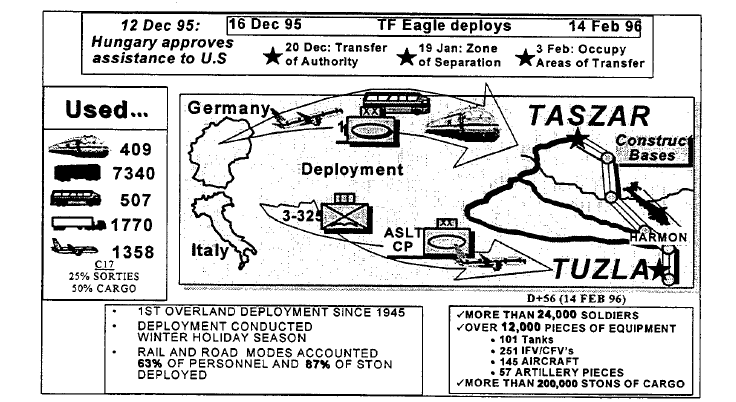 The time and effort required to deploy Task Force Eagle is indicative of the logistic cost of executing operations. Despite much work, air deployable medium weight Brigades as a leading example, land forces have not yet worked out how to conduct operations without this logistic cost. It is safe to assume that a logistic price will always need paid to execute operations. Gaining positions of advantage when conducting operations requires movement. Invariably this movement is made more difficult by weather, geography and politics. Overcoming weather, geography and politics is not a logistic officer problem even if the solutions reside in logistic units. For example, during the movement of TFE Commander V Corps directed changes to the balance between air and ground movement and halted rail movement to the ISB to allow logistic units the time to clear backlogs of personnel and supplies. The maneuver commander controlled the tempo of the movement. The planning and conduct of operations requires Officers and NCO who, regardless of corps, understand the science of moving and sustaining land forces. In small armies there are few officers exposed to the planning and execution of operations. Too many wargames and experiments start with combat forces in a tactical assembly area. This knowledge gap may mean that the capabilities required to execute operations are underrepresented when the design of future land forces is contested. Joint Land Forces can learn how ready they are to conduct operations by exercising the deployment of combat forces from garrison locations to tactical assembly areas. This practice can be achieved with a simple simulation. The loading and unloading of combat forces onto transportation assets can exercised at full scale. This training will illuminate what logistic and command and control forces, pre-positioned equipment and diplomatic arrangements are needed to conduct operations. This training will develop individuals in the Joint Land Forces who understand and can champion the capabilities needed for the conduct of operations. Good small Armies don't just win land battles. They conduct multiple tactical actions synchronised in time, space and purpose to achieve military objectives. The capacity to do this, at distance from an operating base and against adversarial weather and geography, has a logistic cost that must be quantified, reduced as low as possible and paid. 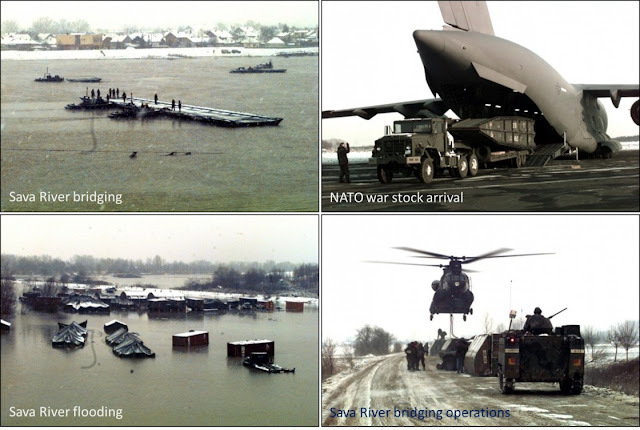 The information and figure 1 used in this post were gleaned from the excellent "The Operation Joint Endeavor deployment: transportation lessons learned and impact on subsequent operations" by Rupkalvis, James A.
James Davis is an Australian Army Officer posted to the United Kingdom. The Armchair Colonel is a repository of articles and commentary germane to the profession of arms. The views expressed on this blog are his own and do not express either those of the Australian Army or the United Kingdom Land Forces. Str_shooter. Awesome Inc. theme. Powered by Blogger.